Before Artusi came along, one had to spend a bomb to get their fill of good Italian cooking (San Gimignano and Le Cirque). Of course there are other cheaper alternatives, but for me they are at best sub par, in front of these names. Despite international cuisine options (non 5-star), springing about all over the city - very few if any at all, give you an authentic experience. Artusi has managed just that and I couldn't be happier. The food served here is rustic Italian, so don't go looking for any contemporary flare. It is certainly more for the purists. 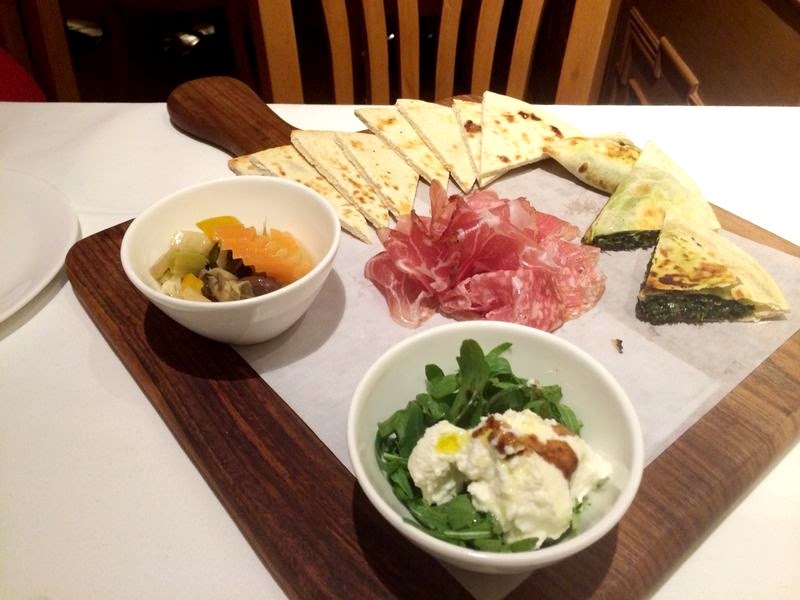 If you like each dish to have an onslaught of cheesy, saucy, spicy tones, chances are you may right off Artusi. I for one, loved the simplicity of flavours here. Now there were some dishes that didn't hit home but don't let that dissuade you because the menu is quite extensive. Plus, the good out weighed the bad by a mile. I have tried Artusi twice. Once as take out and once at the restaurant. There were a few glitches with the service on both occasions. The first time around as take-out, one out of our two mains was never sent. Though they delivered it as promptly as they could, it was really quite careless on their part. The second time around we seemed to be the only table without a bread basket. At first I assumed they don't serve one, so I didn't bother asking. Realising, only after seeing one on every table around us; by when it was all too late. And the next faux pas, I shall get in to later. Over all, the service was poor and haphazard. There seemed to be a disconnect between the kitchen and the floor staff. For the moment I'm willing to deal with it, just for that panna cotta alone. But let me not encourage their disorder. Piadina e Crescione - Now this would have been fine, had you not read what the menu promised. What was to be a platter of "fine" cheeses and "selected cured meats - parma, salame, mortadella", was depraved of the mortadella and cheeseS (emphasis on the plural). To be fair, there was a bowl of rocket, with some fresh ricotta like cheese, but that hardly constitutes as "fine cheeses". I don't know if our definitions differ greatly, but I was expecting at least a small selection! Again this is the lag between the kitchen and the floor that I mentioned. The kitchen should be updating their staff on any changes to the menu, who in return should be informing the customer. Then it is down to the customer if they still want a fairly enjoyable platter, though devoid of half the things promised, or not. Communication is key! Tomino - Is a soft Italian Cheese . Can be either cow's milk or goat's or both combined. It is only consumed after cooking, and has a composition similar to Brie or Camembert though the flavour varies significantly. It isn't too overpowering (however, more matured ones can get quite pungent), and quite easy to like. I absolutely loved this dish! Besides the delicious grilled cheese, the assortment of sautéed enoki and button mushrooms were just heavenly. Though I didn't taste the truffle oil that was promised, I would order this dish again every time. 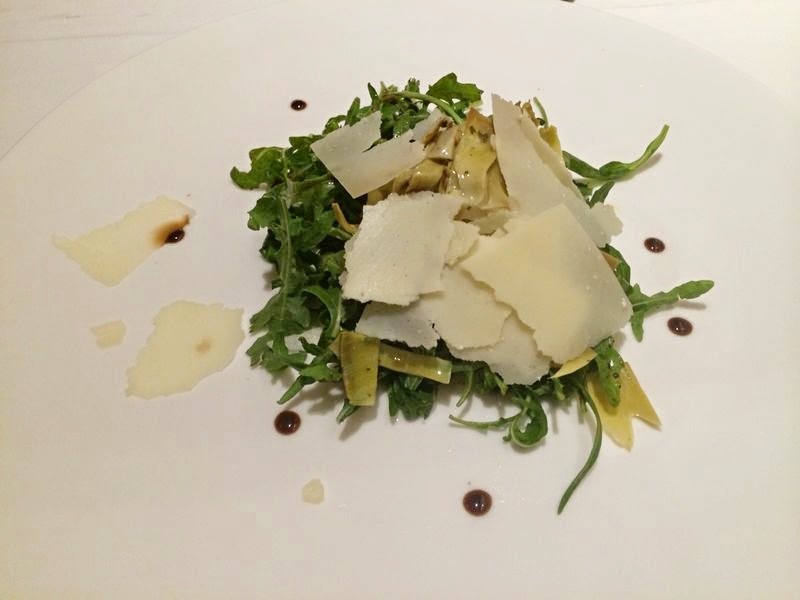 Rucola e Carciofi - A simple salad of baby rucola, artichoke, pecorino cheese & lemon dressing. Really how can you go wrong by ordering this. A great salad to keep on the table for a dose of crunchy freshness. Baby Spinach, Grapes, Pears and Goat Cheese Salad - Topped w/ Pine nuts & Balsamic Vinegar. This salad sounded great, but their main ingredient was their downfall - the baby spinach. If you cannot get the right ingredients, skip the dish all together. I don't quite know what is up with the baby spinach in this country (it has to be more than its picked too late) but it is absolutely foul. One hears baby spinach and expects the tenderest sweetest leaf. 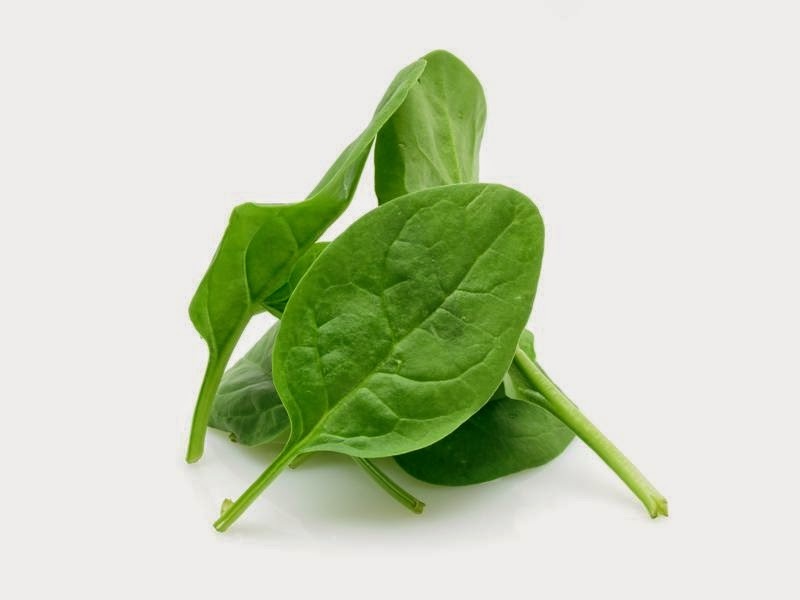 Below is a random image of what baby spinach should be like. Instead you are met with a thick, fibrous leaf, whose bite mimics an ornate plant, rather than one you would find palatable. Better for cow fodder if you ask me. Shame because otherwise the salad has nothing to lose. Crostini - Topped with Chicken Liver Paté & Caramelised Onions - Not bad. Not the best pate I have had but does enough to warrant a repeat. 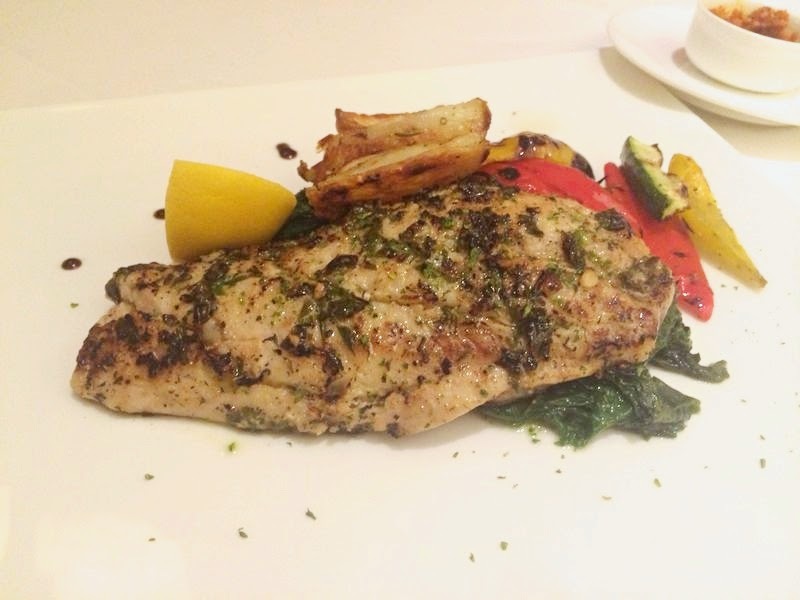 Dentice alla Griglia - Grilled Snapper w/ Breaded Herbs, Grilled Veggies and sautéed baby spinach (only way that spinach should be served!). So my friend who ordered this absolutely loved it and licked her plate clean. My thoughts? I thought it was seasoned and cooked beautifully - though its quality was a bit suspect for me. I found it to be quite smelly. Somehow she didn't, but where I lack in keen eyesight I make up with a flare for smell. I am hoping this was a one off moment because the rest of their ingredients don't let down on account of freshness. 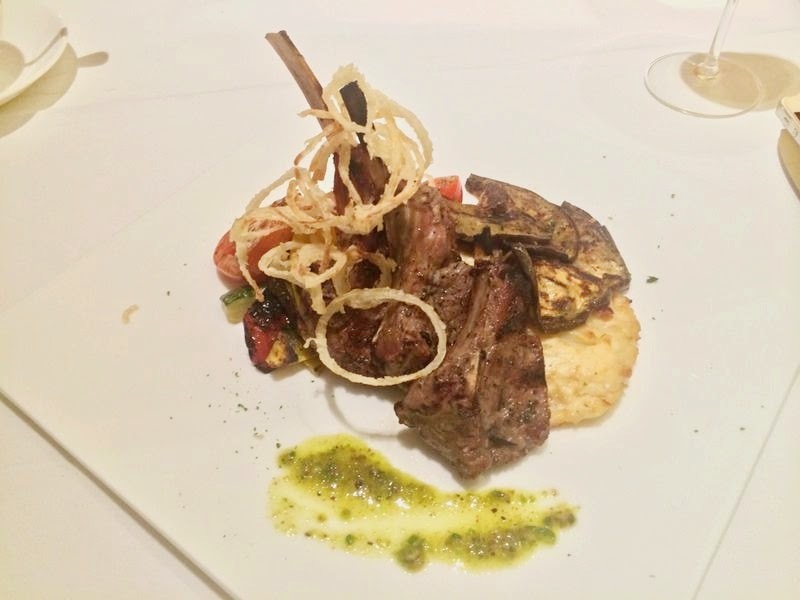 New Zealand Lamb Chops Grilled w/ Pistachio Lemon Oil - I get that it is a true art to cook a piece of meat to perfection, and rarely do restaurants seem to get it right, but like a sucker I always hope. 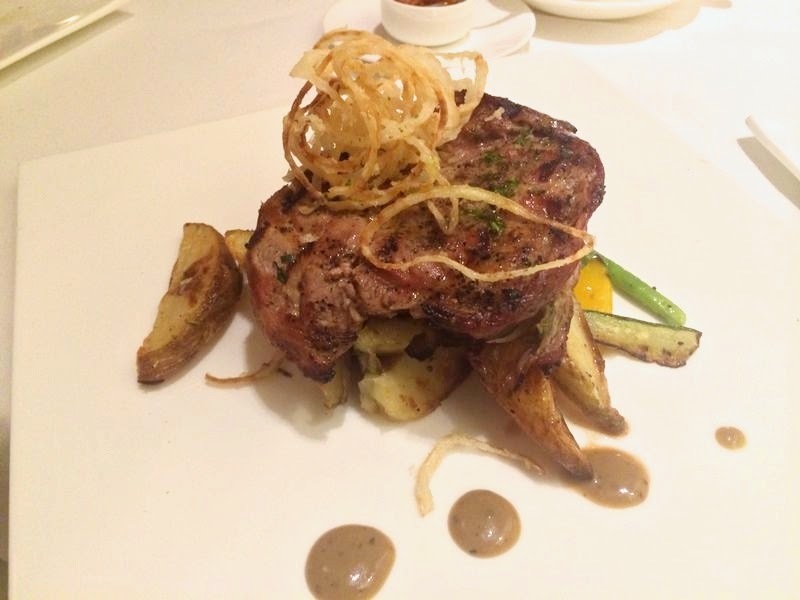 I asked for my rather expensive chops to be cooked to a medium doneness. What I got was nothing short of well done. What should have been a pleasing pink was barely a blush in parts and white through the rest. Tasted fine otherwise, I would probably order it again, but not without insisting profusely that I receive pinker meat! Imported Pork Fillet, wrapped w/ Bacon, served w/ Rosemary Potatoes and Herbed Tomatoes - Tasty, flavourful but again lacked the juiciness you so hope for from a good piece of meat. However, it still far from dry and I am certain some would like it, as did the person who ordered it. But, though, I would hate the thought of undercooked pork; I do expect more meaty juices. Gnocchi Sorrentina - Tomato Basil Sauce w/ fresh Mozzarella di Bufala - The first time I fell in love with this dish was in Venice. At what seemed to be a complete tourist trap, turned out to serve me a dish so wonderful, I still yearn for it, almost romantically. So going back to Artusi's rendition of it, first point I need to make to be fair is that this was part of our take-away order, that not only traveled but was also reheated. The tart, fresh tomato flavours were wonderful. I have had better gnocchi but it is one of the better ones in the city (and again it was reheated). Fairly light in texture and on your belly, the only way gnocchi should ever be consumed. I'm not usually big on saucy dishes, but this particular one I do like oozing with tomatoey goodness, but for that I would like to try it in the restaurant next time, to get a fair idea. Pappardelle Faraona - Broad Home-Made Pasta Noodles w/ a Slow Cooked Ragu of Guinea Hen and Vegetables - I am a complete sucker for ragus. On a trip to Bologna; the land of the glorious Ragu - I probably ate it at least 3-4 times a day (amongst other things) till I left! Nothing warms your soul like a big bowl of warm ragu and pasta. The guinea hen version with veggies, was rustic, with simple yet hearty flavours that one could identify with every bite. I am looking forward to their Bolognese too. 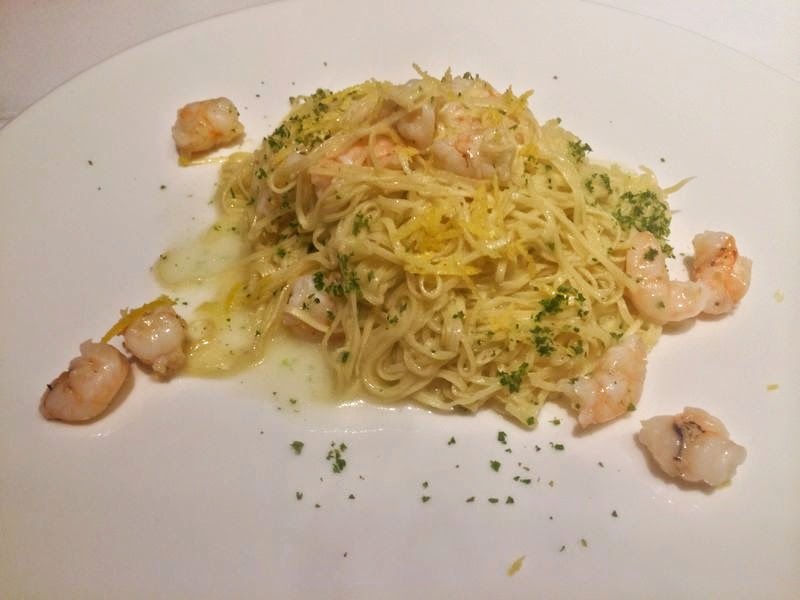 Tagliolino Gamberi e Limon - Thin home-made pasta noodles w/ Lemon Herb Butter Sauce - So one of the things Artusi has bowled me over with is their pasta. Hands down the best in the city if you ask me. And this particular one I am in love with, I promise you I have craved it ever since I ate it. Firstly, the home-made pasta is exquisitely made, so beautifully fine, with the right amount of elasticity that only a labour of love can bring. The buttery "sauce" was delightfully zesty, thanks to a generous amount of lemon zest and juice. So delicious you wouldn't even miss the perfectly cooked prawns. A must try. Zuppa Inglese Meringata - If anything came to near disaster it was this. Again what really ruined it more than the dish itself was the miscommunication. Allow me to expand. What the dessert reads on the menu is: "...Made from a delightful combination of Sponge Cake, Egg Custard, Strawberries, Meringue, and a shot of Italian coffee." 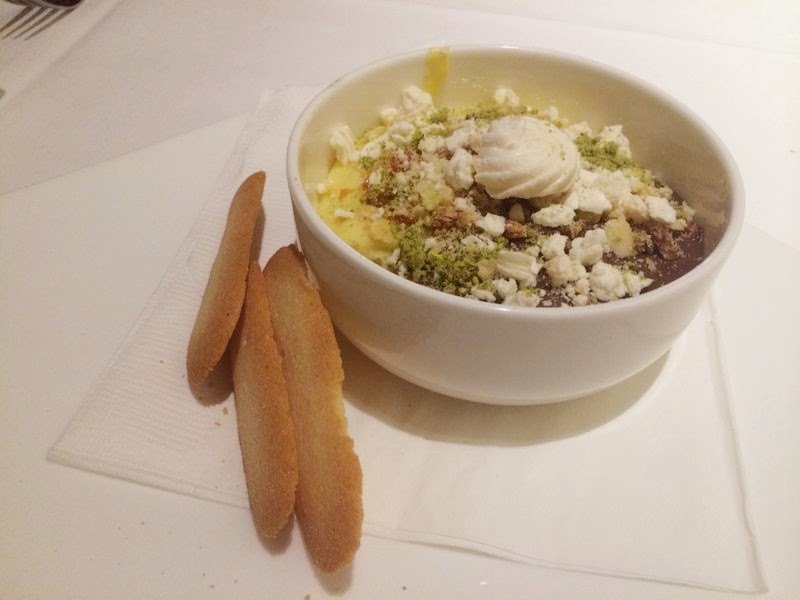 What came to our table was: insipid egg custard (I love egg custard, I always wish for a custard revival, but not quite like this), glopped together with even more bland insipid goo in the form of chocolate cream, topped with meringue bits and pistachio. What about the sponge cake, strawberries and shot of coffee? And where did the chocolate come from you ask? I am just as lost as you are! If the kitchen has run out and they rather improvise than say no; well I am all for that. However, inform your customer that what they will get is going to be nothing like they ordered. Again, then it is down to the customer to decide whether that is still what they want to order or would they like to get something else - I for one most certainly would have skipped this! Here I am excitedly waiting for a dessert full of textures flavours and berries - instead I got a bland bowl of goop best served with dentures. Panna Cotta - Fichi e Mandorle - And this alone could make it all worth it. Another title coming their way - the best panna cotta in Delhi, I would go as far as saying the country, but I haven't tried every contender fit to be its competitor. Smooth, creamy without that heavy mouth feel, and the right amount of jiggle firmly holding it up. Keep digging and you hit gold - in the form of glorious candied figs, lending just the right amount of sweetness to the dessert. The golden pool of caramel surrounding it, gives it a nuance of bitter sweet you realize you couldn't have done without. 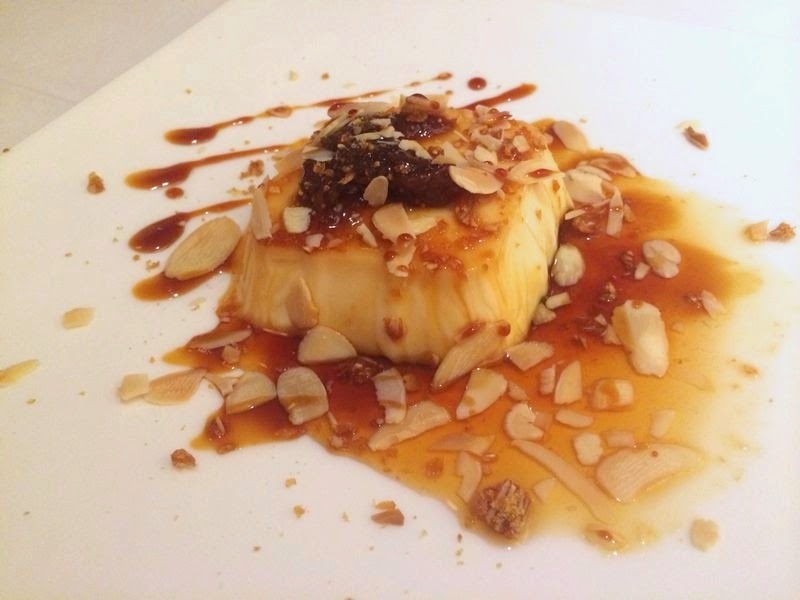 Cream, figs, caramel... toasted almond slivers - Now it is truly a symphony.